Saddam Hussein today refused to enter a plea as a new trial began in which he is accused of genocide over the killing of tens of thousands of Kurdish villagers in northern Iraq. This is the second trial Saddam has faced and he dismissed the US-backed trial, like the previous proceedings, as a “court of occupation” and refused to state his name. He is standing trial alongside six former Iraq army commanders for killings of Kurds in the 1980s. Saddam, 69, once again faces the death penalty over the charges, as do the other accused. Saddam and seven other defendants have already been tried – in the same courtroom as the new proceedings – for the killing of 148 Shias in Dujail in 1982. A verdict in that turbulent trial – which was delayed by outbursts from Saddam and other defendants – is expected on October 16. In the new trial, the court heard today that around 182,000 people were killed by the Iraq army’s “Anfal” operation. “Anfal” is Arabic for “spoils of war”. The 1987-88 crackdown was allegedly aimed at crushing independence-minded Kurdish militias and clearing all Kurds from the northern region along the border with Iran. 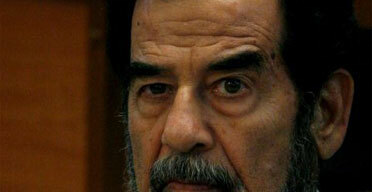 Saddam accused the Kurds of helping Iran in its war with Iraq, the trial heard. Many villages were razed and countless young men disappeared, according to survivors. Survivors say they were targeted with gas, but a later trial will focus on the notorious gas attack on Halabja in 1988, in which 5,000 Kurds are thought to have been killed. In an opening statement, Munqith al-Faroon, the lead prosecutor for the Anfal case, told the court: “It’s time for humanity to know … the magnitude and scale of the crimes committed against the people of Kurdistan. He showed the court photographs of the bodies of dead mothers and children. The prosecution accuses the army of using prohibited mustard gas and nerve agents in the campaign. A map of northern Iraq was set up in the courtroom showing with red stickers the locations where the weapons were allegedly used. “This is the law of the occupation,” Saddam replied. Then he identified himself as “the president of the republic and commander in chief of the armed forces”. The judge ordered a plea of innocent be entered into the record. The top co-defendant in the trial is Ali Hassan al-Majid, who allegedly led operation Anfal, and became known as “Chemical Ali” for the alleged use of poison gas. Today Mr Majid walked into the court using a cane and wearing a red headdress, and identified himself as “fighting comrade First Major General Pilot Ali Hassan al-Majid”. Mr Majid also refused to give a plea, so a plea of innocent was entered for him. The other defendants pleaded innocent. Today’s court session was largely calm and business-like, despite quiet expressions of defiance by Saddam and Mr Majid. The chief judge in the previous trial, Raouf Abdel-Rahman, a Kurd, took a tough line, repeatedly throwing defendants and defence lawyers out of the courtroom. Today, Judge Amiri hardly raised his voice, except when Saddam stepped out for a short break and, when he returned, Mr Majid and another co-defendant stood out of respect for him. “Sit down!” Mr Amiri roared at them three times until they took their seats, as Saddam shot a smile back to his co-defendants. The defence renewed its challenge of the court’s right to try Saddam. Saddam’s chief lawyer, Khalil al-Dulaimi, said in his opening statement that the tribunal “was established by an occupation entity … and occupation authorities have no right to establish courts”. More than 1,000 survivors and relatives of victims of the Anfal campaign demonstrated in the northern Kurdish city of Sulaimaniya today, demanding death for Saddam. “The trial continues” but seriously, what is the point? Everyone knows he did these things, that is undeniable, the issue surrounds the legitimacy of the court set up for the trial. Some will say it is the court of the Iraqi people, others will say that the court would not exist if it were not for the U.S. lead invasion (which is closer to my opinion). If Saddam is the (deposed) leader of a country, what right does any other country have to sponsor and support legal action against him in that country? The best way to do this would have been to kill him at the time he was captured. The second best way to handle this would have been to extradite him. Take him to The Hague and prosecute him there under international law. He would not be in a position to question the legitimacy of international law like he is able to question the laws of Iraq under US jurisdiction. But that’s just my opinion. What the hell do I know?